This map characterizes some of the activities that produce noise at the Stellwagen Bank National Marine Sanctuary. Some of the questions this page seeks to address include: What are the primary activities that produce noise on Stellwagen Bank? How much noise are they producing? Are these activities creating sounds in frequency ranges within the hearing of marine mammals present in the Sanctuary? What are the noisiest parts of the Bank? How does the concentration of noise correlate with marine mammal sightings? This type of study can aid in determining which areas and resources are at the greatest risk from ocean noise and accordingly can provide guidance for the establishment of effective conservation measures. The interactive map uses Geographic Information System (GIS) software to graphically illustrate the location and distribution of noise-creating activities on Stellwagen Bank. This type of display is a useful tool for ocean managers and policy makers because it displays areas where there is an overlap of several noise-creating activities, marine mammals and protected habitat. The viewer may click on various layers (explained below) to view one or several layers at a time. Note that our inventory includes anthropogenic activities that commonly take place on Stellwagen Bank. There are other activities that generate noise such as pile driving and tunnel boring, but we focus on activities that routinely occur in the area. We emphasize that not all activities represented on the map take place at the same time—they are temporally discrete. To go to the interactive map, click here. To learn more about the data included in the map, see below. These data are provided by Leslie Ward from the Florida Fish and Wildlife Conservation Commission and Greg Silber from the Office of Protected Resources, NOAA. The ship tracks have been derived from data compiled through the Mandatory Ship Reporting System (MSR), established in July 1999 to help prevent Northern Right Whale ship strikes. 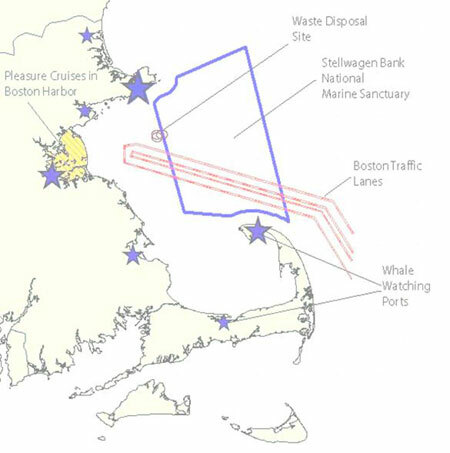 When a ship over 300 tons enters a designated Right Whale critical habitat, an area including Stellwagen Bank National Sanctuary, it is required to report its location, speed, and destination. The ship then receives a message describing the location of any right whales that have been spotted on the surface recently and a recommendation of areas to be avoided. Shipping Lanes: The shipping lanes were taken from NOAA chart 13246; NOS #13009, 27th Edition, 8.7.96; NOS #13267, 28th Edition, 1.25.97. From the reported information, Silber and Ward are able to derive geo-referenced ship tracks. The mean ship speed was 14 knots for the 1999-2000 data. This layer was produced from ship reports gathered between July 2002 and July 2003—but it has been estimated that only 50% of ships in the area during this time reported to MSR. Nevertheless, the layer provides insight into the distribution of large ships in Stellwagen Bank and their seasonal and daily trends. 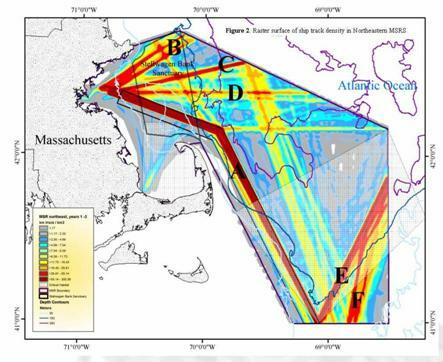 For further information on the methodology and analysis of the data, see “Ship Traffic Patterns in Right Whale Critical Habitat: Year One of the Mandatory Ship Reporting System.” NOAA Technical Memorandum. NMFS OPR 20. January 2002. The port of Boston, while not large by international standards, receives over 20 million tons of cargo annually. Tugs and barges, moving north to Halifax and south to New York, pass directly through the Sanctuary as well. Each year, over 2,700 vessels travel over the bank. The coordinates of the Navy test area have been provided by Phil Denolfo, Range Manager at the Naval Undersea Warfare Center, Newport, Rhode Island. The vessels used include one or two submarines, one to three surface crafts, one or two helicopters to retrieve the torpedo, and at least one airplane to carry marine mammal observers. In 2003, a Canadian natural gas company began seismic exploration in deep water 285 miles due east of Boston. Drilling was expected to begin shortly thereafter. For more information see: Press Release from Canadian Superior Energy, “Canadian Superior Proceeding Full Steam Ahead with ‘Marquis’, ‘Mariner’ and ‘Mayflower’ Offshore Projects, June 16, 2003; also Gene Laverty, “Natural Gas Drilling planned 285 miles off Boston Shore, The Providence Journal, June 22, 2003, at F2. Regarding other exploration projects in the area, see: R. Davis et al., “Environmental Assessment of Seismic Exploration on the Scotian Shelf, a report prepared for submission to the Canada/Nova Scotia Offshore Petroleum Board, August 5, 1998. This layer has been provided by Dr. David Wiley from the International Wildlife Coalition and the Stellwagen Bank National Marine Sanctuary, and Just Moller and Kristin Zilinskas of the Stellwagen Bank National Marine Sanctuary. The points represent fixed fishing gear sightings in the sanctuary. The data were collected using 15 designated line transects across Stellwagen Bank. The exact geographic coordinates of the fishing gear was approximated using an estimated radial angle from the ship’s heading, a time reading, and estimated distance. The data is a compilation of a survey period from July 2001-June 2002. The sanctuary was surveyed every month: it took three days to survey the entire sanctuary for each month’s data collection. The fixed gear data gives an indication of the concentration of fishing activity on Stellwagen Bank: where there is fixed gear (primarily gillnet and traps) there will be noise from the fishing vessel that tends the gear. It is difficult to predict, however, how much noise is associated with fixed gear because vessel activity at fixed gear locations is variable. 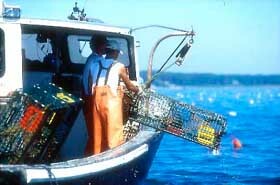 On average, gillnets are usually not left out for more than one day because they can get tangled and cut. Traps are usually tended daily during the summer, but every three to six days during the spring and fall. At a minimum, in the northeast, traps must be checked at least every 30 days as mandated by the Atlantic Large Whale Take Reduction Plan. This plan also requires that when whales are sighted in an area fishing gear must be removed, known as Dynamic Area Management and Seasonal Area Management. Stellwagen Bank is a popular location for recreational boating, fishing, and other activities. Although the location and intensity of these activities are not presently well documented, they could significantly contribute to ocean noise in the Sanctuary. Consequently, the effects of recreational activities should be considered when developing comprehensive measures to address ocean noise. 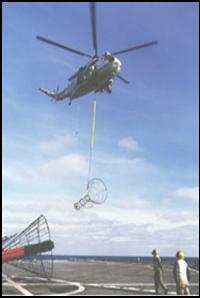 Stellwagen Bank is regularly used by several academic institutions that conduct acoustic and oceanographic research. These include Woods Hole Oceanographic Institution, University of Rhode Island, University of Connecticut, University of Massachusetts at Dartmouth, and Mass Maritime Academy. Whale watching is a popular recreational activity in Stellwagen Bank National Marine Sanctuary—companies line the coast from Provincetown to Newburyport. The whale-watching season begins in April and ends in October for nearly all the companies that operate in Stellwagen Bank. Because the schedules of each whale watching company are readily available, we were able to create a master calendar, with resolution to the hour, of whale watching activity on Stellwagen Bank. (Download data). However, due to missing schedules, inclement weather and other factors, the compilation should not be regarded as an exact tally of the boats on the water during summer 2003, but rather as an approximation and indicator of trends in whale watching activity. The graph to the right shows the average number of commercial whale watching boats on the water at any given time (between 8AM to 8PM) for each month. Included in the graph are the monthly means, standard deviations, minimums and maximums. The maximum was calculated based on a hypothetical scenario in which all whale watching companies sent all of their fleet out at once. The maximum, therefore, shows how much activity the current infrastructure allows. The second graph shows the average daily number of boats on the water, by hour of the day. The results were based on an average taken over the season. The peak time for whale watching cruises is around 2 PM. The whale sighting data was compiled by Dr. David Wiley from the International Wildlife Coalition, in conjunction with Just Moller and Kristin Zilinskas of Stellwagen Bank National Marine Sanctuary. The data were collected using 15 designated line transects across Stellwagen Bank. The exact geographic coordinates of the whales were approximated using an estimated radial angle from the ship’s heading, a time reading, and estimated distance. The data is a compilation of a survey period from July 2001-June 2002. The sanctuary was surveyed every month: it took three days to survey the entire sanctuary for each month’s data collection. For more information on the methods and results of Dr. Wiley’s research, see “The Distribution and Density of Commercial Fisheries and Baleen Whales within the Stellwagen Bank National Marine Sanctuary”: July 2001-June 2002. MTS Journal, Vol. 37, No. 1, 35-53. More information on the marine mammals present in the Sanctuary is available at the SNMS website. The current concept of the territorial sea was established by the 1982 Law of the Sea Convention which stated that every “the sovereignty of a coastal state extends beyond its land territory to an adjacent belt of sea, described as the territorial sea.” The territorial sea can be no farther than 12 nautical miles, measured from baselines. Source: Art. 2 of the 1982 Law of the Sea Convention. 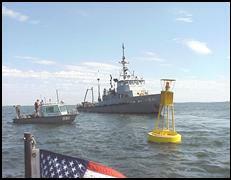 The state submerged land border is three miles seaward from the mean low water line. This line divides oceanic jurisdiction between federal and state authorities. A result of the Submerged Lands Act, the border determines whether energy and mineral resources are subject to state or federal control.